Acalyptratae is a subsection of Schizophora, commonly referred to as the acalyptrate muscoids (or simply acalpytrates). It is a very large assemblage, exhibiting very diverse habits. The name refers to the lack of calypters in the members of this group of flies. One or more longitudinal rows of smaller to larger setae in the median part of the scutum, the rows being either regular or irregular (with setae more or less scattered). 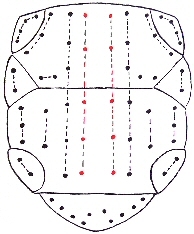 includes segment 8, the postgenital segments, and the cerci. A species that has arrived in the geographical area specified from somewhere else by any means (for instance with cargo). Compare with invasive species . Hines, J.S., 1911. 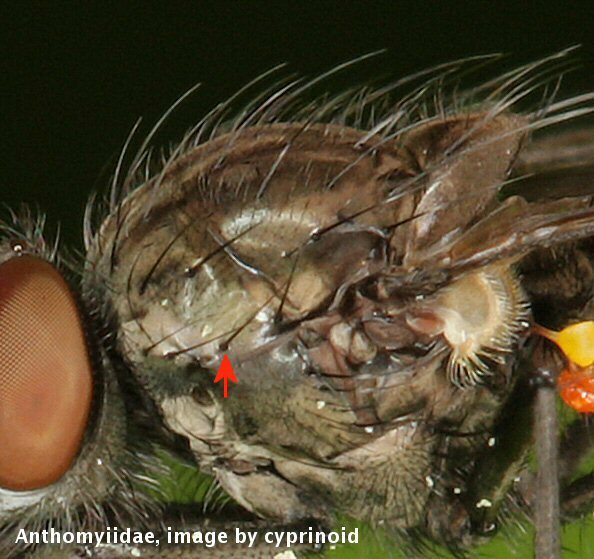 New species of Diptera of the genus Erax. - The Ohio Naturalist 11(6): 307-311. The next two stages in taxonomy are systematising (beta taxonomy) and evolutionary studies (gamma taxonomy). Dorsal part of the lateral plate of the thorax that is associated with the second segment that originally formed the thorax. Located in the direction of the head when considering a position along the longitudinal axis. Even a structure near the apex of the abdomen has a side that is directed towards the head end and another that is directed towards the apex of the abdomen. Likewise, every structure perpendicular to the longitudinal axis of the body (leg, wing) has a side that is directed towards the head. Large setae placed on the anterior part of the notopleuron , immediately posterior of the postpronotal lobe . Located in the plane between anterior and dorsal . Located in the plane between anterior and ventral .